Not since a 42-to-1 underdog named Buster Douglas knocked out undefeated heavyweight champion Mike Tyson in 1990 has there been an upset like economics professor Dave Brat defeating House Majority Leader Eric Cantor in the Republican primary in Virginia. You couldn't write a script like this for a movie and have it be believable. Congressman Eric Cantor, with all kinds of name recognition, and outspending his opponent by 5 million dollars to $100,000, lost 55 percent to 45 percent against somebody that virtually nobody ever heard of before. 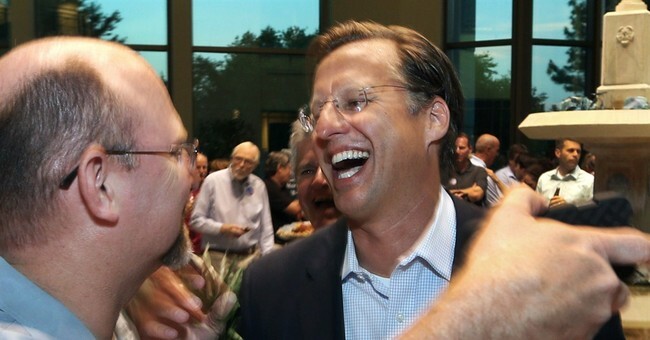 Polls, incidentally, had predicted that Cantor would defeat Brat 62 percent to 28 percent. To add a touch of absolute fantasy to the story, Dave Brat's Democratic opponent this fall is another professor at the same Randolph-Macon College where Professor Brat teaches. Who would believe that in a movie? In the end, all of this will be just a curious footnote to what this election means to the Republican Party and -- more important -- to the country at large. To those in the media who see everything as just a contest -- a "horse race," as they say -- between different individuals and factions, this is being reported as a victory of the Tea Party over the Republican establishment. One of the encouraging things about Professor Brat is that he apparently does not see it that way. He says that he is for the same principles as other Republicans, but that he believes in putting those principles into practice. Unlike those Republicans on either the establishment side or the Tea Party side who are preoccupied with their internal party battles, Dave Brat is focused on the issues confronting this country at a crucial juncture in history and with the immediate task of defeating the Democrats in this fall's election. If this primary election defeat puts an end to cocky talk by Republican establishment leaders about crushing their Tea Party rivals, there may be some hope that they can spare some time to deal with the serious issues facing this country, rather than their own ego indulgences. A key issue in this campaign was amnesty for illegal immigrants. Apparently the Republican leadership in the House of Representatives -- which is to say, House Speaker John Boehner and Majority Leader Eric Cantor -- thinks that amnesty is not amnesty if you call it "immigration reform" and toss in some fig-leaf requirements before the amnesty kicks in.